Home Color Ideas	Which Colors Will You Choose? Which Colors Will You Choose? 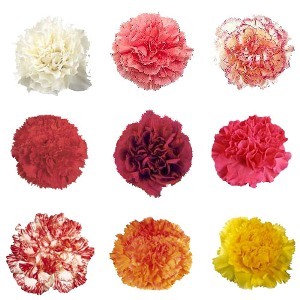 Carnation flowers are full and fluffy and are great for creating soft, ruffly texture. This Carnation pack is available with 150 stems, packed in 6, 25 stem, bunches. So, you can pick up to 6 different colors, with 8 color options available. Spray Roses are the perfect compliment to any arrangement, filling in space with color and texture. 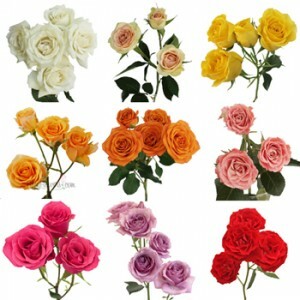 Choose a package of either 8 or 16, 10 stem, bunches and choose up to 4 different colors, with 9 color choices available. So, if you order the 8 bunch package you will receive 2 bunches of each color selected, and if you order the 16 bunch pack you will receive 4 bunches of each color selected. 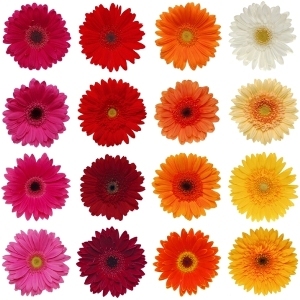 Gerberas are whimsical, fun, and perfect for adding pops of bright color. They are also a favorite for Fall! This package is offered in 8, 10 stem, bunches, but with 7 color choices available. Rose Petals are a DIY wedding must as they are easy to work with and have unlimited uses! Aisle designs, flower girl fun, petal tosses, easy centerpieces, and so much more. 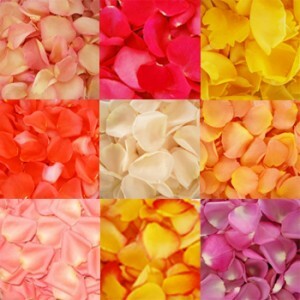 Choose from 6,000 (13 bags) or 12,000 (26 bags) petal packs and then choose up to 3 colors, with 13 color choices available. You also have the choice of mixing your color choices together or keeping them in separate bags. So, which Flowers and Colors will you Choose? Head to FiftyFlowers today to place your order and Save!